After deciding to proceed with a breast reconstruction, one of the first and largest decisions facing our patients in Dallas is considering either breast reconstruction with tissue expanders and implants or using your own tissues. Though in some cases it may be necessary to use a combination of both methods (see Latissimus Flap Reconstruction), most often, one or the other is used. With advantages and disadvantages to each approach, and results likely lasting a lifetime, it’s an understandably difficult decision to make. Breast reconstruction with implants and tissue expanders is a great option for women left with little to no breast tissue following breast cancer surgery. At the Texas Center for Breast Reconstruction, board-certified plastic surgeons, Dr. McKane and Dr. Duffy, are proud to help women like you on your journey to wholeness and will be with you each and every step of the way. They have extensive experience in performing breast reconstruction and always offer the safest, most effective, and most advanced treatments possible. For breast reconstruction with tissue expanders, Dallas patients have two implant types to choose from: saline and silicone. Both types are made of a solid silicone shell with the difference being one is filled with saline solution and the other with cohesive silicone gel. Saline implants can be filled with varying amounts of saline water to achieve a patient’s desired shape, size, and firmness. In the rare instance that a silicone implant leaks, the sterile water is absorbed into the body safely. Silicone implants are extremely popular and offer a natural look. The shell of the implant comes with a set of amount of silicone gel that comes in a variety of sizes, shapes, and textures. We will take your goals and concerns into consideration as we provide you with information on implant safety and differences, as well as our recommendation for which option will best meet your needs. Insertion: a tissue expander, very similar to an implant but initially containing only a small amount of fluid, is inserted beneath your skin where the new breast will be located. Expansion: after your incisions heal from the insertion stage, your doctor will begin the process of expansion. This is achieved in short, 10 –15 minute appointments every 1 – 2 weeks by injecting additional saline into the expander to increase its size, also causing expansion of the overlying skin. Patients usually find the expansion to be relatively painless. Completion: once the expander reaches your desired size, your surgeon will remove it and replace it with your permanent implant. For women who lack sufficient tissue elsewhere on their bodies or who would rather avoid the scars associated with flap type reconstruction, this procedure provides a great alternative. The recovery from the initial expander placement surgery is usually quicker than flap surgery. It may be easier to control the final size of the reconstructed breast with implant reconstruction. There are no additional scars on the patient’s body other than those on the breasts. Because most patients require placement of an expander followed by replacement with an implant, at least 2 surgical stages are needed, plus multiple visits to the surgeon’s office in between for tissue expansion. For patients having a unilateral (one-sided) mastectomy, matching the contralateral natural breast with an implant can be difficult. The shape and feel of an implant is not exactly like that of a natural breast. In the short term, implants can become infected or shift position, requiring corrective surgery. 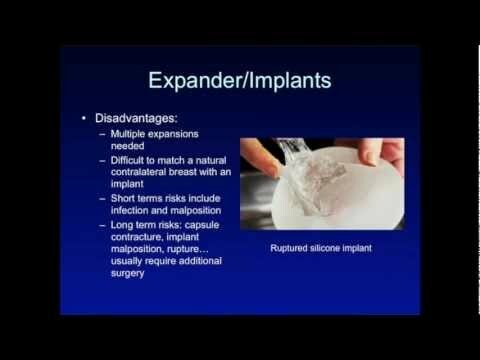 In the longer term, implants can develop capsular contracture (tightening of the soft tissues around the implant), implant malposition, and implant rupture. All of these can require secondary procedures. Breast reconstruction is an important milestone in breast cancer recovery, helping to renew the patient’s body and spirit. Dallas breast reconstruction patients often choose breast reconstruction with expanders and implants as a way of feeling whole again and having their appearance reflect their true selves— not their illness. The plastic surgeons of Texas Center for Breast Reconstruction in Dallas, TX, Dr. Duffy and Dr. McKane, use an individualized treatment method that they can discuss with you further during a consultation. Please contact our office to schedule a consultation.